Not running when you are perfectly able to is not fun. When you’re injured, it makes sense. It hurts. You don’t want to. But when you’re in that I’m-not-injured-but-I’ll-probably-get-injured stage, it’s super boring. My ankle, so far, feels about the same as it did at the end of last week. I’m constantly questioning whether running will actually harm it. So, I decided to go check out my Google search history to see what happened the last time I hurt an ankle. Google search history is a scary place. There is a definite theme of it being tender ABOVE the ankle itself, so it seems like it could be similar. The only difference (currently) is that I’m not in pain yet, and I don’t remember if my ankle was popping a lot last year. My search results this time around are leading me to the same high ankle sprain links. Seems like a good, safe idea to stay off of it. Guess I’ll just be playing more Civ V.
I’m so tired of being injured. You’re getting a Runkeeper view of the last 30 days because (a) I only ran once this week (well, I only count one as a run), so the Nike+ graph is pretty boring, (b) I keep track off all my cross-training on Runkeeper, and (c) I can’t make Runkeeper only show me the past week. The green signifies running; orange is walking; pink is cycling (stationary bike); and blue is the elliptical. On Tuesday, I went to the gym to crosstrain. I did 10 minutes on the elliptical, 10 minutes on the stationary bike, and 20 minutes doing a very slow walk on the treadmill (I didn’t even go a mile…I mean, very slow). My ankle didn’t bother me at all on the elliptical or bike, but I could sure feel it when walking. Sigh! I went back for more crosstraining on Thursday. This time I just stuck to the bike. I had lost the earpieces to my earbuds, so I went in thinking this was going to be a sucky workout with no music or TV to listen to. I chose one of the bikes with the virtual scenery. This was nice, but as I soon found out, these bikes (at least that I could tell) don’t tell you how far you go. So I did 25 minutes on a virtual scenery bike, which I can only guess was about 4.5 miles based on the fact that Tuesday I did 2 miles in 10 minutes. Also, I hate the stationary bike. I’m sure I have the seat adjusted improperly or something, but it is torture for my quads. Saturday morning I got up and decided to test out my ankle very gently. I did a mile of intervals: 30 seconds jogging, 1 minute walking. I could still feel my ankle, but it wasn’t death. After that, I headed out to the grand opening of Fleet Feet’s new store in Green Hills. The first 100 people in line got a free gift card worth a random amount from $10-$200. I got one, but it was only worth $10. (Still, a free $10 is better than nothing! Thanks, Fleet Feet!) Some people in front of me had brought their whole family, including several children under age 5, all of which got a gift card. Another reason to have kids, I guess. I wonder how much they totaled in free gift cards. Anyway, I thought about getting some new socks, but they didn’t have any Injinji’s, so I opted for some Yurbuds instead, since, as I mentioned, my other workout earbuds are broken. Then Sunday, I got to start day one of my new modified half training plan. 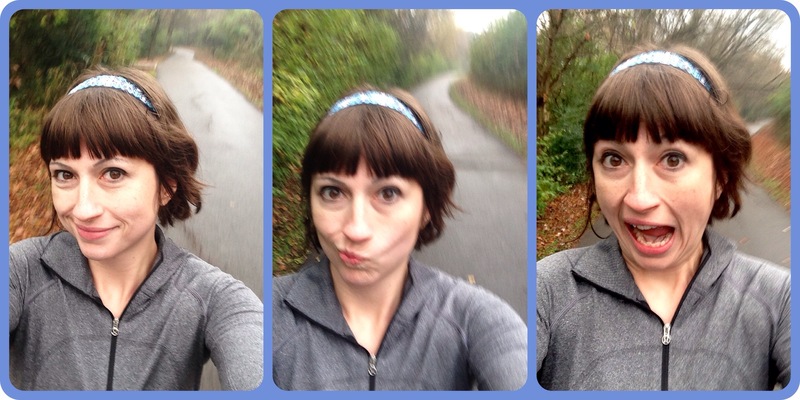 I did two miles of intervals; this time I did 1 minute running, 1 minute walking. I didn’t do too bad! Check out some of those run times near the end; not bad for someone with a gimpy ankle! Anyway, my plan is basically to slowly build my running intervals, increasing maybe 30 seconds each week. That would be put me around intervals of 4.5 minutes running, 1 minute walking by the half. I probably won’t run it with defined intervals, but I like having the option. I suspect my intervals will be something like: run until I see Mickey…take a photo and walk a bit…now run through Cinderella’s Castle! It was 30 degrees with a wind chill of 23, and this was the first time I had ever run in below freezing temperatures. 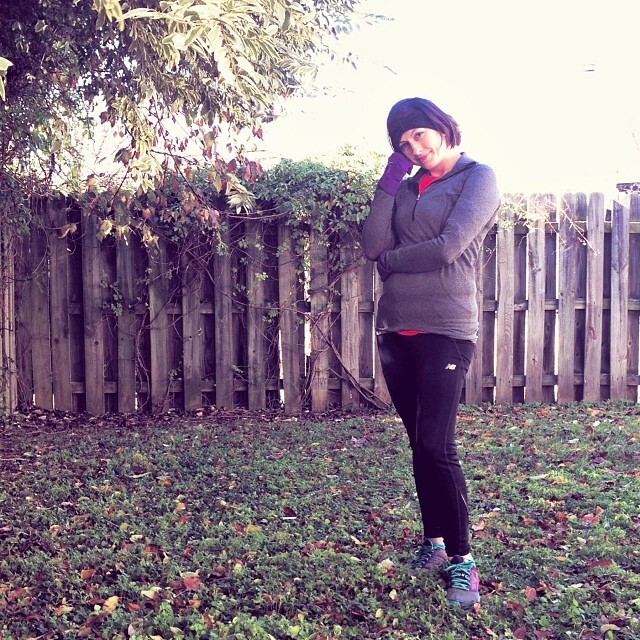 As I layered on all my running clothes, I giggled to myself about how non-brand loyal I am when it comes to running. Does anyone have any tips on keeping my nose warm though? I mean, short of running around in a balaclava. 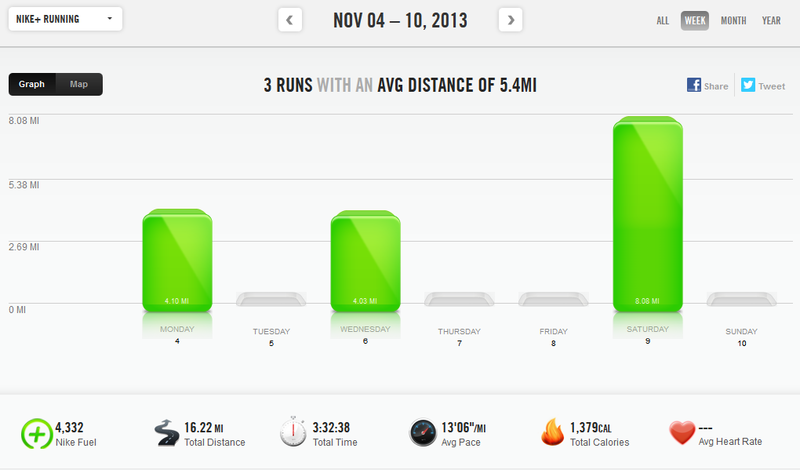 I don’t have a pretty graph for you this week because I didn’t run. My ankle is still bothering me. I cared for it all week, icing it and elevating it and all that jazz. I even went to the gym on Thursday and worked out for 20 minutes on the elliptical and bike. By Friday, I was able to walk on it okay and traverse stairs gently, so I decided to walk The Mo Run on Saturday morning. My alarm went off at 5am (*yawns*). Did I mention it was my birthday? That is way too early to be up on my birthday. I arrived around 6:30 am, ankle brace on. It was a pretty small race, with less than 150 people. Too bad I wasn’t running, maybe I could have placed in my age group or something. Anyway, a little after 7am, we were off. I took it pretty slow and by half a mile in, I was in last place. I enjoyed myself and posted goofy photos on Instagram for entertainment. Around the one mile mark, I saw I was gaining on some people (one of them may have been a small child), so I decided it was my race goal to pass them. I got pretty close, but then they cut course just after the water stop. Yeah… (And from what I heard afterwards, several people did. Wonder how many I really would have beat had they not.) I was offered water, but I looked at them like they were crazy and said that I wasn’t really straining myself. I never really came close to anyone after that, so I finished dead last. But, hey, it was in less than an hour! AND I had negative splits, ha! 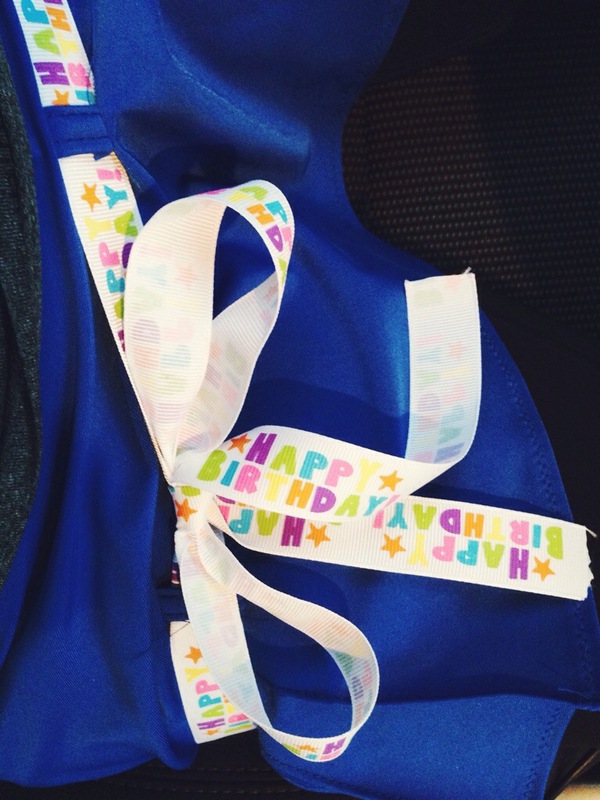 I also had a really cute ribbon on my running skirt. That’s all that really matters. Although I probably pushed too hard in trying to finish in under an hour, since now my ankle actually hurts more than it did last Friday. Ah well. So it looks like I’ve got at least one more week of no running. Guess I need to start hitting the gym more this week to crosstrain. The week started out so well. On Monday and Wednesday I hit the treadmill for 4 miles each day. The workouts went well, despite the feeling that I’m working harder on the treadmill than I should be at the (slow) speed I’m going. On Saturday, I went out for what would be my longest run to date: 8 miles. I started out trying intervals of 2 minutes walking after each mile of running, but I think I should have started with every half mile, as I got worn out pretty early on. Still, I managed to keep my average pace under a 13 min/mile, which was the goal. Also, the Nashville Marathon had gone on earlier in the day and apparently I happened upon several miles of its route! 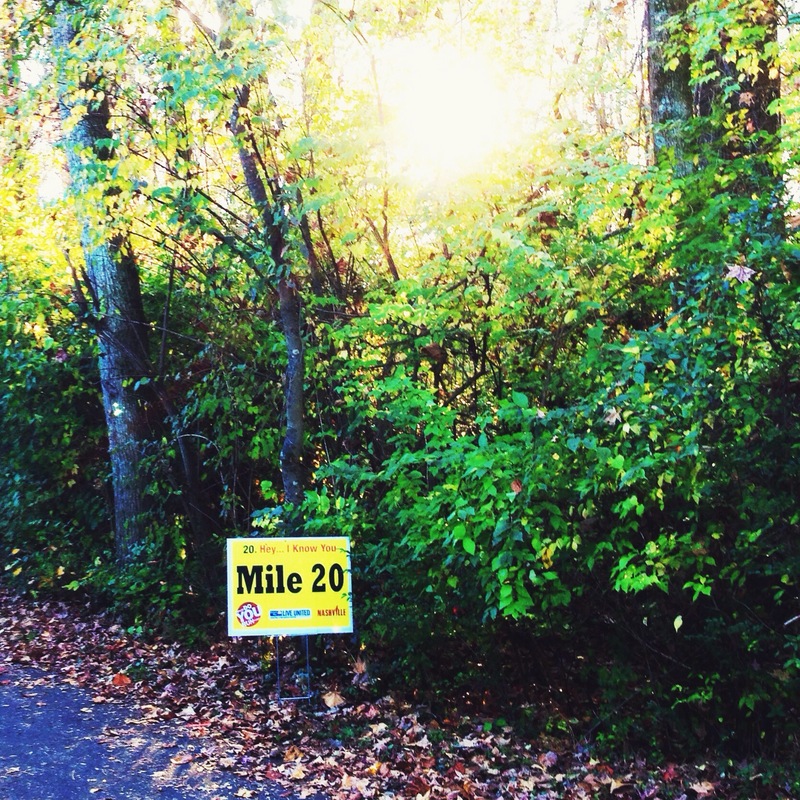 This was actually like mile 5 for me. For my last few runs, I’d been noticing a slight twinge in my ankle. Nothing serious, but the same ankle that hurt back in April (before I started this blog). I started really noticing it during these eight miles, but still it didn’t seem so bad. However, on my last mile, I could really feel it, and it was hard to finish out the mile. When I reached the end of my eight miles, I sat down on a bench to catch my breath for a moment. When I stood up to walk to my car, I nearly fell down. I couldn’t put any weight on my left foot at all. I shuffled to my car and made it home, where I spent the next 36 hours RICE-ing my ankle. Now it is Tuesday and it is still killing me. I can get around, sort of, but any wrong movement and I’m in searing pain. I’m guessing it’s a sprain, though there’s no swelling or visible bruising. I suppose it could be some sort of overuse injury, since it was just a couple weeks ago I was wondering if I was overtraining. So running is out, probably at least for the remainder of this week. Good thing it is a recovery week. I definitely need to see a physical therapist to figure out if there’s something in my running form that is causing me to repeatedly get injured. I just hope that I’m able to continue with my training for Disney!